SAN ANTONIO (AP) After being run ragged by the Spurs’ ball movement for years, Ricky Rubio continues to get some payback in his first season with Utah. Rubio scored a season-high 34 points and added nine assists, and the Jazz upended San Antonio 120-111 on Saturday night for their fifth straight victory. Utah shot 57 percent from the field and had 26 assists in its second win over San Antonio this season. LaMarcus Aldridge had 31 points for the Spurs in the final home game before embarking on their annual monthlong rodeo road trip. It was Aldridge’s 10th game with 30 points this season after doing so just five times in his previous two seasons with the Spurs. He was one of the few bright spots for San Antonio, which lost three times during the five-game homestand after losing just three home games prior. Despite arriving in San Antonio late after playing Friday night in Phoenix, the Jazz rolled over the Spurs. The Jazz were without star rookie Donovan Mitchell, who missed the game due to an illness. Rubio made sure they had no trouble replacing the production of their leading scorer. Utah was 5 for 8 on 3-pointers in the first quarter, including two from Rubio over second-year player Dejounte Murray. Jazz forward Royce O’Neale added 18 points, making all four of his 3-pointers in scoring a career high. San Antonio struggled offensively in the first quarter as it did throughout the homestand. Jazz: Alec Burks made his first start of the season. He finished with eight points and eight rebounds in 25 minutes. . Rodney Hood played 16 minutes after being listed as probable with a bruised lower leg. … G Joe Johnson sat the game out to rest. 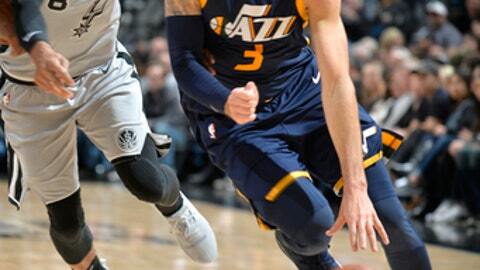 … The Jazz beat the Spurs 100-89 in Salt Lake City on Dec. 21. Spurs: Murray became the first player since Kawhi Leonard with 500 points and 300 rebounds in his first 100 games with the Spurs. … Brandon Paul did not play after being downgraded from questionable with back spasms. … The Spurs’ next home game is Feb. 28 against New Orleans. The Spurs hit the road again for their annual sojourn in February, but they enter it under unusual circumstances. San Antonio has struggled for much of the season, battling injuries to key players like Leonard, Tony Parker and Rudy Gay and trying to adapt to rotation changes. The Jazz have the longest active winning streak in the NBA, which Gobert attributes to one thing. ”I think we’re just better defensively,” Gobert said. ”It makes the offense better. We move the ball, we share the ball. Ricky’s making shots. Just having fun. Jazz: At New Orleans on Monday night. Spurs: At Phoenix on Wednesday night.